A sadvhi (female sadhu) performs for a crowd at the eastern entrance to Pashupatinath where purification rituals take place. An orphan boy uses a magnet to collect left over offerings from purification rituals. Two bodies (in orange) are laid out on the eastern ghats for purification in the Bagmati River. Friends and family of the deceased pray, and say their final goodbyes. Mother and son on the third floor of Aryaghat Sewa Kendra, an Aruveydic Hospice for the terminally ill, on the banks of the Bagmati River inside Pashupatinath Temple. 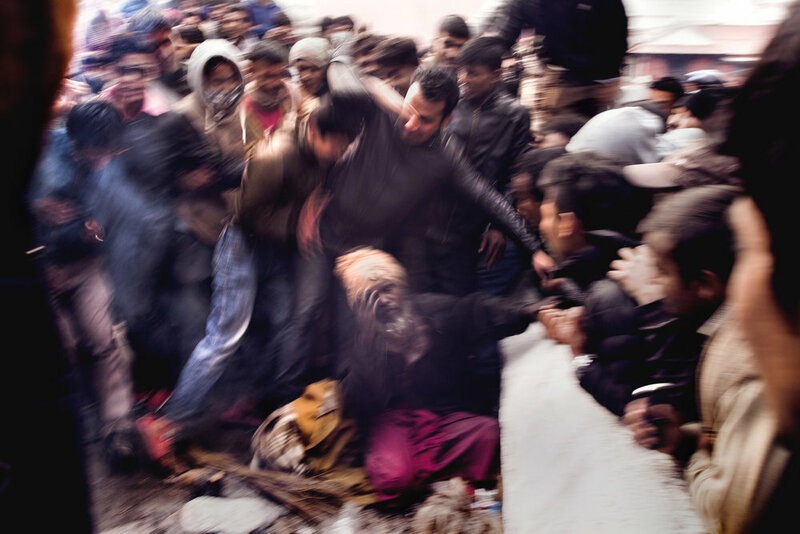 A son watches on as two student doctors perform a cornea extraction on his mother who died shortly before on the ground floor of the Aruveydic Hospice. After, the body will be purified in the holy waters of the Bagmati. 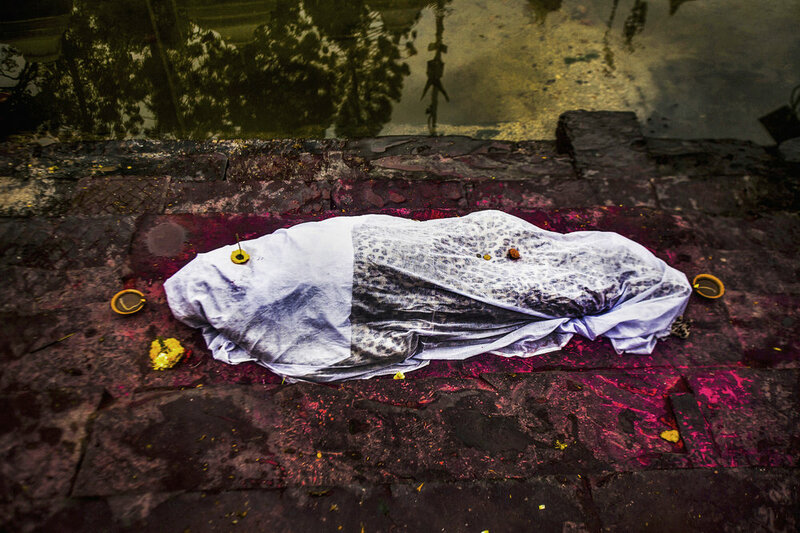 A body on the eastern bank of the Bagmati before purification. 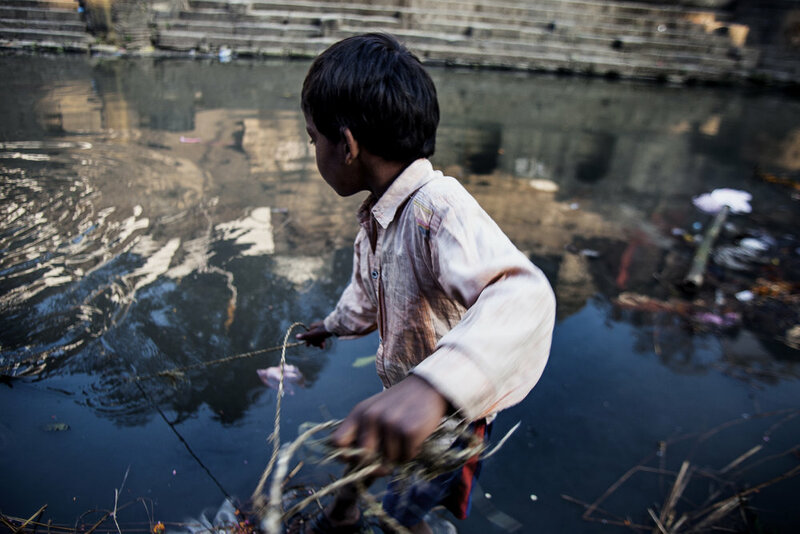 An orphan boy dives into the Bagmati River. A sadhu, or holy man, originally from England prays in the setting sun on Pashupatinath's western bank. 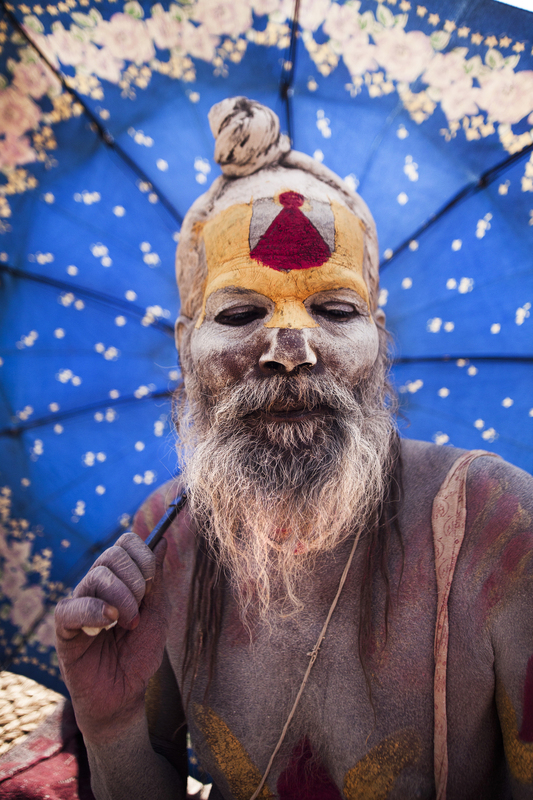 A sadhu, known as Fruit Baba. 38-year-old Rupa smoking in her bed above Pashupatinath's northern cremation ghats. Two sadhu's on the western side of Pashupatinath. Sadhu 'Hanuman Ji' (Hindu monkey god) in his evening wear inside the sleeping quarters for sadhus at Pashupatinath. A sadhu shields himself from the midday sun. A blind man from Briddhashram home for the elderly, situated next to Pashupatinath, Kathmandu, Nepal. Friends and family use the torches on their phones to shed light on a cornea extraction after a power outage. The extraction is performed by student doctors directly after purification rituals in a tiny room next to the northern cremation ghats. Four brahmin brothers, at the northern ghats reserved for higher castes, moments before cremating their father. The eldest will light the body via the mouth. A few minutes after the pyre is lit, he will then perform Kapal Kriya, which involves cracking the skull with a bamboo stick to encourage the soul to depart. Relatives film the beginning of a cremation of an elderly man at Pashupatinath's northern ghats. Death is believed to be contagious. For this reason Doms (a subcaste of the Untouchables) are the only caste allowed to touch dead bodies and perform cremations. Here a Dom prepares a wooden pyre for the cremation of a young woman at Pashupatinath's northern ghat. 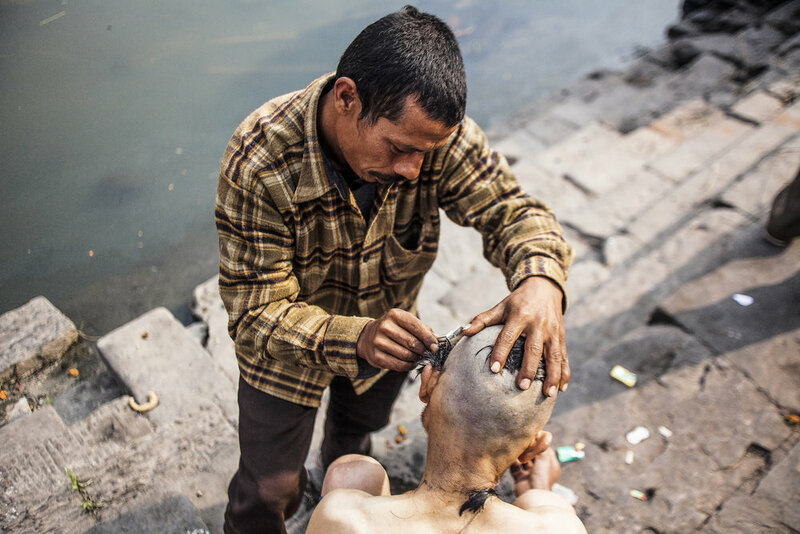 A barber shaves off a man's hair after the cremation of his father in a ritual known as Tonsure—a symbolic offering to the gods, that pays respect to the departed soul. A man washes in the Bagmati River after Tonsure. A sleeping sadhu who travelled from India for Maha Shivaratri, an annual festival in honour of Lord Shiva (who is also known as Pashupati). Close to one million people travel from all over India and Nepal to Pashupatinath Temple. A man sleeps under a blanket in a waiting room for mourners next to the southern cremation ghats.